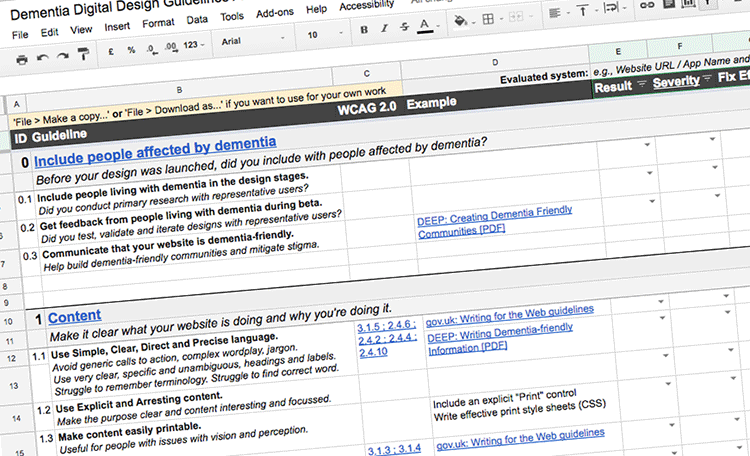 Dementia guidelines/heuristics in a framework in a Google Sheet. A dementia-friendly guidelines/heuristics framework for use evaluating digital systems like websites, apps, web content and user interfaces. Now also available as How to design a website for someone affected by dementia — a blog post for Alzheimer’s Society. There are nearly 1 million people living with dementia in the UK and this will grow to over 2 million by 2050. Dementia is non-discriminatory; it affects people from all backgrounds and across generations. and other physical health conditions too. People affected by a diagnosis should be included in all stages of design. Not only will this help you understand, validate and meet real needs, but it’ll also help improve your empathy for those for whom you are designing. consider using specialist research participant recruiters. avoiding using abbreviations and acronyms. Each type of dementia can damage the visual system in a number of different ways. Dementia also tends to affect older people, although it can affect people from their 30s. This can mean that age-related visual decline may affect the person living with a diagnosis, or their carers, too. avoiding the use of blue, especially for important interface components. Making letter shapes and words simple and easy to perceive improves readability and comprehension for all people on all devices. avoid using multiple fonts, unnecessarily. This may make the interface and content confusing. Most of these guidelines are inclusive in nature. This means that they can improve the ease of use of a service for many people, even if they don’t live with dementia.